Last week, I showed you a smart monthly income strategy that hands you $3,333 a month on a $500k investment—all in dividends alone. This easy monthly dividend setup works out to an average 8% yield (or $40,000 a year on our $500k) paid out to you every 30 days like clockwork. I think you’ll agree this is plenty of cash for many people to clock out on. So today we’re going to talk growth. Because our $3,333-a-month “8% strategy” already crushes Wall Street’s flawed 4% rule. You know the one: it recommends that you draw down 4% of your nest egg a year by selling stocks to supplement your dividend income. There’s nothing wrong with the dividend, but a market meltdown forces you to withdraw money at exactly the wrong time … and sell your shares at fire-sale prices. If you lived through the 2008/09 crisis, you might be nodding your head in agreement right now. 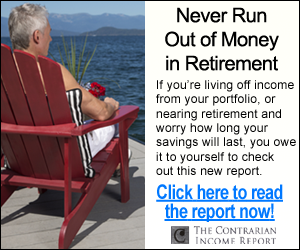 This scenario shows why this 4% “advice” is a recipe for running out of cash in retirement. 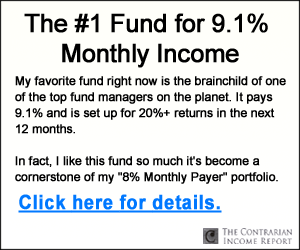 Luckily, with our “monthly dividend” technique, we’re keeping our capital intact and collecting 7.8%, 8.9% and even 10.5% yields, to boot (these are actual payouts from my Contrarian Income Report service’s portfolio, which boasts 18 stocks and funds, 11 of which are monthly payers). And believe it or not, we can do even better with some savvy asset allocation. If you’re not yet as filthy rich as you hoped you’d be by now, don’t worry—we still have plenty of time to get you there. Here’s how. Let’s rewind to our $500,000 example. It’s a round number you can dial up or down depending on how much money you have to invest. A CIR subscriber with this portfolio spread among our positions is earning $75,000 in dividend income alone. And a big chunk of that dividend cash is rolling in monthly, serving up a nice, placid income stream that comes in at exactly the same frequency as the monthly bills! But what if this person doesn’t quite need $75,000 per year yet? If not, that’s great—we can peel off a piece of that portfolio and set it up to grow 24.8% in the next year, enough to double our initial stake in a little more than 3 years (I’ll show you how I’ve arrived at this number below). And I’m not talking about investing this “growth capital” in risky, high-flying investments like Tesla (TSLA), Snap (SNAP) or, heaven forbid, Bitcoin. We can scale our money more securely—but just as spectacularly—by purchasing sound dividend payers that happen to be growing their payouts rapidly. Here’s why. 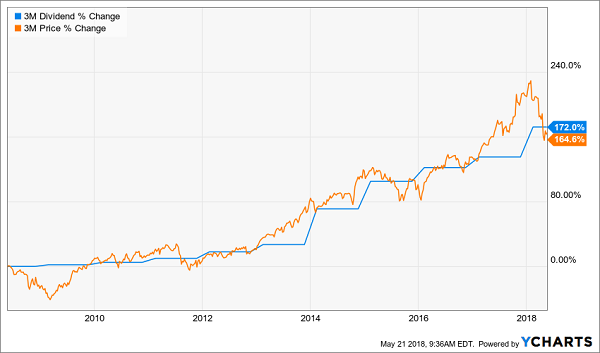 Everyone loves the dividend, but investors usually don’t give enough love to the dividend hike. Not only do these raises increase the yield on your initial capital, but they’re also often are reflected in a price increase for the stock. For example, if a stock pays a 3% current yield and then hikes its payout by 10%, it’s unlikely that its share price will stagnate for long. Investors will see the new 3.3% yield and buy more shares. They’ll drive the price up and the yield back down—eventually toward 3%. 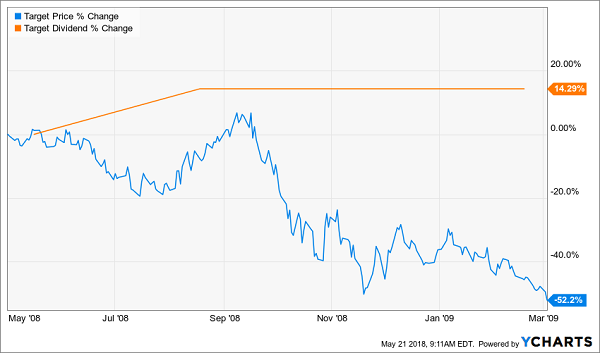 This is why your favorite Dividend Aristocrat—a company everyone knows and has paid dividends forever—never pays a high current yield. Its stock price rises too fast! For example let’s look at 3M (MMM), which pays around 3.9% now, and whose yield always seems to hover between 3% and 4%. Today’s dividend already gets you ahead of the 3.0% yield on the 10-Year Treasury note. That’s right, 3M increased its dividend by 172% and its stock rose 165%. This is an incredibly tight correlation, and it’s no coincidence. I’ve seen this exact same pattern play out time and time again. We can easily use it to “time” our purchases for maximum upside, along with an increased dividend stream. That’s exactly what unfolded. 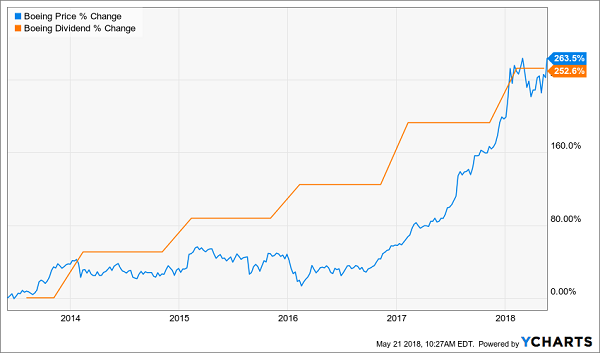 By the time we sold Boeing on January 19, 2018, we’d more than doubled our money (142% total returns) in just about 3 years. The bottom line? Since share prices move higher with their payouts, there’s a simple way to maximize our returns: buy the dividends that are growing the fastest. As you can see, as much as possible. This strategy is such a “slam dunk” for investing returns that there’s no reason to collect more current yields than you need right now. If you can “forego” some amount of income today, I would encourage you to consider investing that capital into dividend growers. That alone is better than you can get from most other conservative investments now. Step 2. Over time, your dividend payments go up so you’re eventually earning 8%, 9% or 10% a year on your original buy. That should not only keep pace with inflation and rising interest rates, it should stay ahead of them. This combination of rising dividends and capital appreciation gives you the potential to earn 24.8% or more, on average, with almost no effort or active investing at all. So which “hidden yield” stocks should you buy today? Well, you know me—I’ve got 7 best buys that should safely double your money every 3 to 5 years. It’s a simple formula—their dividends are doubling every 3 to 5 years, which means their prices will rise in tandem. At the same time, we’ll collect their dividend payments today and enjoy an even higher income stream tomorrow. If you achieve returns of 24.8%, you’ll double your money in just a little more than 3 years. So if you haven’t been following this strategy, why not? The best time to get started is now—before the 7 dividend growers I mentioned begin to move. Click here and I’ll share their names, tickers and buy prices with you right now.